Great contemporary design and construction. Weather and fade-resistant rattan and aluminum. Called Deco because it reminds us of Miami's Sobe art deco ultra chic pool areas. Yes, we call it Deco because it reminds us of Miami's Sobe art deco distrcit's ultra chic pool areas. This gorgeous lounger will be perfectly at home in a modern Mexico outdoor terrace, delighting and entertaining your guests and providing sturdy comfort and relaxation. 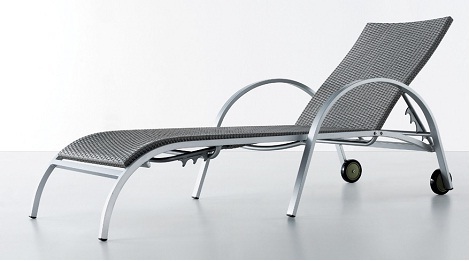 Made of fade and weather resistant rattan and aluminum. Lovely design and outdoor appeal.